Perhaps I am sort of a slacker Mom. Who am I kidding? I AM A SLACKER MOM. I am totally, completely, utterly, definitively, and let's make sure we're clear on this- so done with spoon feeding the baby. Having to sit there for however long Little Man decides to eat his meal, making sure he doesn't spit it all back out, containing the mess when he does decide that having a mouth full of green bean puree is the perfect time to start blowing raspberries, I am just so done! So to summarize: I am ready to become less of an integral part in Little Man's every meal. (with every fiber of my being) What makes this prospect difficult is the fact that my baby has four teeth in total. For some reason, (most likely just to toy with my sanity) my babies acquire their teeth none too quickly which means they have a limited chewing capability for normal, non mashed up foodstuffs. Ok, yes. I know you are supposed to take the purple lid off. But, being the stellar blogger I am, I forgot to take a picture of Little Man actually eating out of the pouch. (I was buying stuff off the Gymboree clearance sale at the time- see what I mean?! Multitasking! Yay!) Do you see his tray? That is the exact amount of mess the kid made whilst gobbling down his butternut squash and apple pouch. Now that is a mess I can live with, people! He needed minimal support doing so. He dropped it over the side once, and at the end I pushed out the remaining food. It was such a refreshing change of pace! 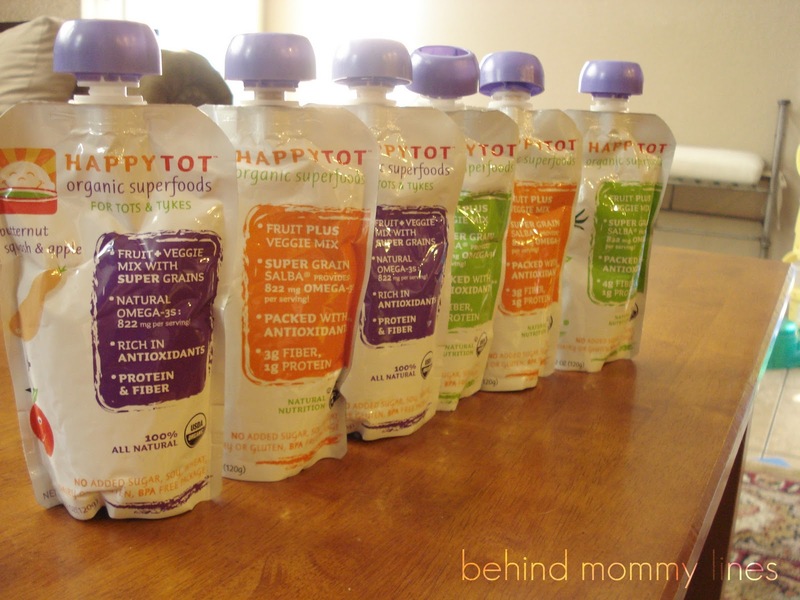 Anyway, Happy Tot pouches come in a ton of flavors and age ranges, and while I haven't tried it "on the go" just yet, I'm sure it will be brilliant! brilliant! brilliant! I may just have to blog about it again. 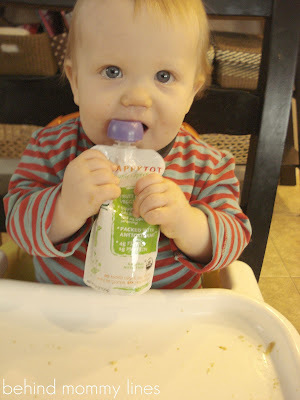 (because seriously, where do you put a dirty baby spoon when you're eating out or trying to get in one last errand before naptime? I have about ten zillion little plastic bags containing dirtied spoons just sitting in my purse- waiting for me to get with the program and throw them in the washer- it's a dumb system) Happy Baby as a whole has quite the variety of other food items as well, from puffs, to melts, and all sorts of munchies, their website also says they have frozen stuff too! Could you ask for more? No- you really couldn't. And if you did, you'd just be greedy. Ok, seriously. One of the best parts about these pouches? I don't have to schlep down to Whole Foods to pick some up! (while you can get them at "Whole Budget") I found them at Target! And the good people at Target, predicting my every whim a week ahead of time, had already sent me a coupon for them too! I WISH they had those with Hailyn!! It was a pain hauling bottles of baby jars- HEAVY HEAVY bags with an infant in tow- and the glass- oh my made me nervous- and I had to buy a LOT (not I wasn't a mommy that made her own food- shoot me- I know- I have TONS of other things to do- so yes my child ate gerber) anyhow those seem awesome!! if you HAVE to do baby food not packaged like this (which by the way, i LOVE these) you can always stash that dirty baby spoon in a Spooneez utensil holder (mini & travel size). Look us up: www.rollupthemess.com! !